On May 2, 2014 May 2, 2014 By JillIn Mommy Confessions, Mommy Musings, The Cookie Chronicles, Thirty day challenge - Make it, Do it, Love it, What's Going On? Busy day! Good busy! 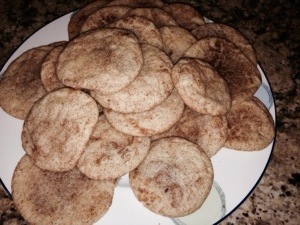 Spent the morning baking these awesome cookies – Snickerdoodle Surprise! I don’t think that is the official name but that’s what we’re calling them. My brother in law’s girlfriend, Courtney, told me about them and we love them! Always pays to ask someone what they’re baking these days! The cookies are Snickerdoodles, stuffed with a marble size ball of Cookie Butter! Those who have seen me in the last week know all about Cookie Butter- really goes to show you the power of word of mouth…I am sure at least eight people will be buying this at Trader Joes soon! Yum. Arianna is loving this on her pancakes, which I totally forgot to mention that Tom made these tasty ricotta cheese pancakes, from SCRATCH, of course! and people, just so you know – BISQUICK is not from scratch pancakes! Just because your mixing, doesn’t mean home made! 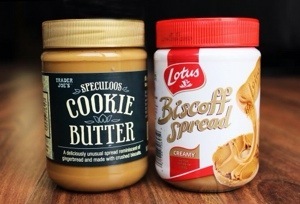 This is what cookie butter looks like and its close counterpart, Biscoff Spread- picture, care of Courtney! After I picked Gia up from school, we had two of her friends over! So fun with all of the laughter and playing in the house! 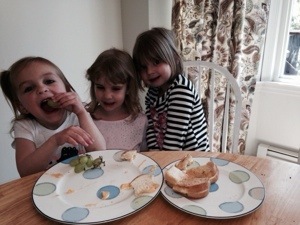 Grilled cheese and grapes- felt like such a Brady Bunch moment! Took Gia to gymnastics and brought her teacher some of the magical cookies! She was thrilled and said it was such a great surprise and was just what she needed today. Ahhh, behold the magical power of cookies, sure to cheer up any mood, just say the word aloud – COOKIE, sounds so sweet and innocent, a simple COOKIE, melts all your troubles away…bringing you back to childhood, mommy’s kitchen, homework at the table, simple joy. And screeeeeech, stop the fantasy! Many of us were coming home to an empty house, rummaging around in drawers looking for leftover fortune cookies, but hey, at least it was a cookie, right? Fun playing in the park for a bit after gymnastics, we met more friends ! That makes two new numbers I scored in my phone today for future play dates! I am so damn cute and fun- people just love me…..oh, wait, it was the kids that we’re playing, I’m just their kangaroo … Let’s just say I have a high jump and a big pouch …. Meaning I bring the kids everywhere and have lots of room for making new friends! Ok, I totally apologize, sometimes I am so odd. Do you know that people used to ask me if I was high years ago and I didn’t even know what that meant! I can be a bit of a space cadet, OH WELL!!! It seems to have gotten me this far! I ate a half of a Reese’s Pieces Brownie (leftover from a batch I made for a friend’s birthday celebration – it was amazing! Two mini peanut butter cups from the half pack that was still in my pantry! One savory Snickerdoodle surprise cookie, oh that sweet goodness in my mouth! 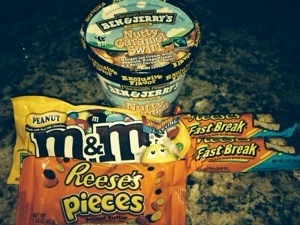 The usual Jill would keep on goin…I mean look at what else I have lurking in my closet. But I stayed strong, a few more not so fab nibbles tonight, couple bites of the kid’s sweet potato fries, a few bites of their leftover grilled cheese, but no major food frenzy!!! Hurray for Jill! OK! OK! I’ll take three!